I had a really good morning, taking the dog to get a pedicure (a/k/a getting her nails trimmed, since I’m too scared to do it myself), then taking her out to play fetch, and generally ride around. We don’t have a fenced in yard, and live on a busier street, so we haven’t tried taking her out back without a leash. We have to get more creative to find more open places for her to run around. There’s a really nice park not far from us, but they can be strict about the leash policy. I would not be disappointed if they wanted to put in a dog park there. After we got home, I went out food shopping. I haven’t gone food shopping by myself in a long time. I like to take my time and go down every aisle. The man — he doesn’t. I was good about my purchases today, and didn’t buy any junk food whatsoever. I’m trying to watch what we eat, specifically eating a lot more vegetables and less pasta. We eat a LOT of pasta, largely because I know how to make it. The man also has multiple rice dishes in his repertoire. But damn, trying to eat healthy can be expensive. Even more concerning than the expense: will all of that food go bad in my fridge when I inevitably don’t make it? I tried to get a good mix of easy things (grapes, blackberries and clementines for taking to work), cooking vegetables (cauliflower, a zucchini, peppers and onions for stir fry) and lazy cooking vegetables (frozen green and wax beans, frozen butternut squash). Tonight’s dinner was a success (meatloaf, mashed cauliflower and the beans)–I won’t be too upset spending money on all this food if we are actually successful about eating it. I really want ice cream now. Because I’ve still got some honeymoon spending to do, so I don’t want to post a lower number, only to see the negative number grow. I listen to a lot of Dave Ramsey podcasts on the train home from work. I definitely feel like he would tell me I need to pay off my loans on an even faster timeframe than I am. I am paying for my wedding (in spite of the fact that we’re already actually married) and our honeymoon. While I think we’re being pretty frugal, we are still going on vacation for two weeks. But it’s going to be a looooong time before we’re going to be able to do this again. It’s been five years since I’ve been on an actual vacation — and I think I’m enough on the path to paying off my debt that I can reward myself a little bit. Should I be feeling guilty about this spending? After my contract is up, should I be cutting my cable? Should I be taking the $40 I round up my mortgage, and applying that to my next student loans (even though my mortgage interest rate is actually my HIGHEST–however that’s possible). Should we stop any grabbing sushi about twice a month? Should I be bringing PB&J to work everyday? (Full disclosure: I actually love me some PB&J, as long as the right kind of jelly is involved). Should I not be contributing to my retirement, even though we’re 31 and 32, and have less than $20,000 saved collectively? Should I clear out my savings (the stuff that isn’t earmarked for something specific)? I think it’s easy to follow simple rules, but I think everyone’s individual situation is a little different. And because I’m making actual progress on my loans and have a drive and plan to pay them off, it makes more sense for me to enjoy life a little, and to address multiple financial goals (savings, retirement) while paying off debt. I’m happy to pay off interest instead of more personal investing, but I’m not willing to turn my nose up at things like a 401k match. Does anyone else feel the same? Last weekend, I changed my cell phone from Sprint to Ting (which is on Sprint’s network). I definitely put in the wrong amount of data usage in my bill estimate, but I’m still confident that my bill with Ting will be lower than my Sprint bill. With Sprint I had unlimited data. Not having that is going to be a big change for me. The way Ting is set up is that there are minutes, messaging and data groups, and the group you fall in at the end of the month (small, medium, large use, etc.) determines how much you pay for that portion. 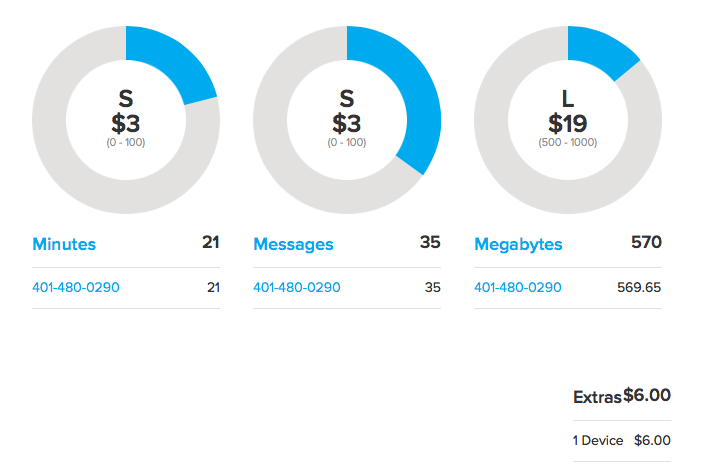 The most I would expect to spend for the data portion is $29, so I would be surprised with a bill over $45. Either way, I need to be more careful about my usage. I turned off my MBTA commuter rail alerts–with the snow they sent me around 500 messages last month! Most of my messaging is through iMessage, where I’m not paying per message (but it does take up a little(?) data while I’m not on wifi. All of my mail is either set to “fetch” or at most to pull every hour, instead of more often. Turned off cellular data for the majority of apps. I can’t tell you how many times I tried to check my email or facebook while I was at work today. Hopefully this will make me more pre more productive at work, once I get used to not checking constantly. Any other advice on how to minimize data use? UPDATE: So far, I feel like I’m failing at not compulsively checking my phone (and turning Cellular Data back on for individual apps when I feel like using them). So far, from March 8 (?) I’ve used 570 Megabytes, and have to stay under 1000 if I want my bill to be $31. I don’t think this is going to happen this month, so I think I’ll be looking at $29 for data, for a total bill of $41. I don’t think I’ll go over on text messages or minutes–but this means I shouldn’t answer my phone just to mess with “Rachel from Card Services.” In August, if I haven’t been saving buckets of money each month, I might switch to a family plan on Verizon with my hubby, and take advantage of the 12% discount, but only if it is in line with what I’ve been paying, or I think there’s a major difference in service. As far as the service itself goes, if you have Sprint (Ting uses their network), and don’t use a lot of data, don’t hesitate to switch over to Ting. I haven’t noticed any difference in the service itself, and either way my monthly bill will be cheaper, even if by smaller amounts than I’d hoped.